"Stop in to visit our modern shop facilities. Let us show you what we can do to make your job successful." Architectural Glazing Systems, Inc. serves Glass Dealers and Architects throughout the New England area and beyond! Take Route 93 South to Exit #4, Route 24 South (towards Brockton, this is a left hand exit). Exit at 19A and merge onto Harrison Blvd. Get into left lane immediately, and turn left onto Pond Street. (Bank of America is on the left). Take first left onto Bodwell. Go right on Murphy Drive. We are all the way to the back and on the left. Take Route 128 South to Route 24 South (towards Brockton). Exit at 19A and merge onto Harrison Blvd. Get into left lane immediately. 1/4 mile from the exit, turn left onto Pond Street at the first intersection (Bank of America is on the left). Take first left onto Bodwell. Go right on Murphy Drive. We are all the way to the back and on the left. 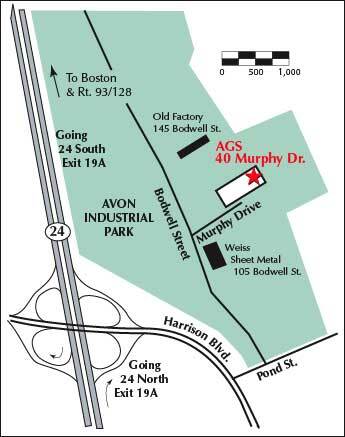 From Route 495, take exit for Route 24 North (towards Brockton) and get off at exit #19A, Harrison Blvd. At end of ramp merge onto Harrison Blvd. and get into left lane. 1/4 mile from the exit, turn left onto Pond Street at the first intersection (Bank of America is on the left). Take first left onto Bodwell. Go right on Murphy Drive. We are all the way to the back and on the left.